At Westend Bistro, Dela Cruz looks forward to upholding the restaurant’s strong tradition of refined, skillfully-crafted cuisine, while offering creative new dishes that exhibit his unique strengths, and highlight the tremendous local sources of the D.C. area. We don’t just serve a meal, we create a lasting memory through the guest’s dining experience. 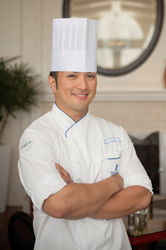 Chef Alvin Dela Cruz joins Westend Bistro of The Ritz-Carlton, Washington D.C. as Chef de Cuisine at a time when the city is continuously, and rapidly, gaining culinary stature. Since the day Dela Cruz arrived in the city, he has been exploring its hidden savory gems, and visiting local farmer’s markets to gain a deeper understanding of the city’s modern energy, anchored in deep rooted traditions. Dela Cruz was Restaurant Chef at The Conservatory of The Ritz-Carlton, Half Moon Bay where he fostered his passion for organic, locally grown produce and developed creative, seasonal dishes that showcased his culinary talent. The Ritz-Carlton Hotel Company, L.L.C., of Chevy Chase, Md., currently operates more than 90 hotels in the Americas, Europe, Asia, the Middle East, Africa, and the Caribbean. More than 30 hotel and residential projects are under development around the globe. For more information or reservations, visit the company web site at http://www.ritzcarlton.com, for the latest company updates, visit news.ritzcarlton.com and to join the live conversation, #RCMemories. The Ritz-Carlton Hotel Company, L.L.C. is a wholly-owned subsidiary of Marriott International, Inc. (NASDAQ:MAR).